Join us for the Grand Opening at Northshore Ridge in Kenmore! Our model home grand opening is this Saturday and Sunday, August 4th and 5th, 11 a.m. to 5 p.m. The first three homes have already sold in this 12-home community! Northshore Ridge is located on a quiet road that’s conveniently located off Simonds Rd for an easy connection to Hwy 522 in Kenmore. 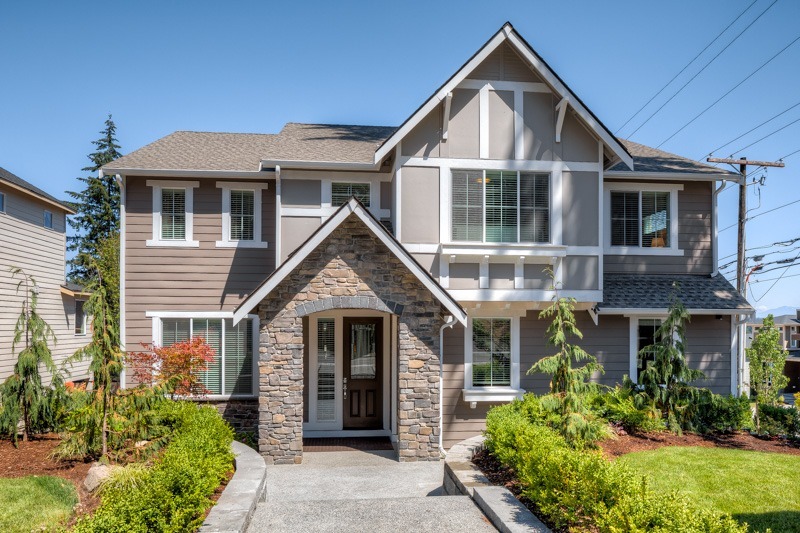 In the sought-after Northshore School District, this community is close to Saint Edward State Park, Inglemoor High School, the Inglewood Golf Club and the shops and restaurants of Bothell’s revitalized town center. Many homes have a verdant territorial outlook and views of the Cascade Mountains. Two spacious plans are available at 3,215 or 3,725 sq.ft., with the next available homes ready to move in early this fall. Lot 9 – 3,215 sq.ft. – 4 BR/3.5 BA + Bonus Room + Den + Outdoor Living – $1,024,950 – Ready to move in this October. Lot 11 – 3,725 sq.ft. – 5 BR/3.5 BA + Bonus Room + Den + Outdoor Living – $1,224,950 – Ready to move in this September. Home interiors come complete with our highest level of finishes. Stairways have contemporary horizontal open rail. Contemporary gas fireplaces have floor-to ceiling tile and a wood mantle. Great rooms step out to covered outdoor living, perfect for catching a breath of fresh air no matter the weather. You’ll love entertaining in the kitchens, with a huge work island, stainless steel farmhouse style sink, pendant lights, stainless steel appliances, quartz countertops, full-height backsplash and rich wood cabinets with lower cabinet pull-out shelves and glass accent upper doors. Master bedroom suites are large enough for your king-size furniture, and have a five-piece ensuite bath with floor-to-ceiling walls of tile, fully tiled walk-in shower, soaking tub and quartz-topped dual-sink vanity. Convenient second floor laundry rooms have a utility sink and cabinet storage. The 3725 plan homes some unique features included. The lower level bonus room has a built-in wet bar/kitchenette with cabinets, sink and under-counter refrigerator. Combine this with the adjacent bedroom, 3/4 bath and second laundry room, and you have a wonderful living suite for guests or family members. This plan also features a relaxing sitting room off the master, complete with double-sided fireplace. Come tour our model home this week! Open Friday through Tuesday 11 to 5 at 16449 84th Ave NE, Kenmore. For more information or a private showing, call or text Garla Allen, 425.890.1470.